It's been a while, but we're back with an incredible 7-story issue! I really appreciate your continued support after the switch to the new semiannual schedule. 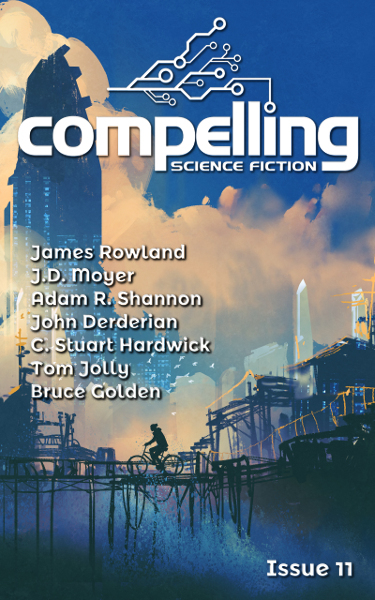 This issue starts with James Rowland's "Top of Show", a metastory about the art of creating stories (5948 words). Our second story is "Targeted Behavior" by J.D. Moyer. In it, someone wants the homeless to leave San Francisco. A young girl has other ideas. (4600 words). The third story this issue, Adam R. Shannon's "Redaction," is a story about medics who use technology to deal (or not deal) with their own traumatic experiences (4953 words). Next we have "Cold Draft" by John Derderian. This is a short one about how a radical politically motivated law surprises a teenage boy (2900 words). Our fifth story is "Dreams of the Rocket Man" by C. Stuart Hardwick. This is a beautiful reprinted story about a child learning rocketry from an enthusiastic mentor (7600 words). 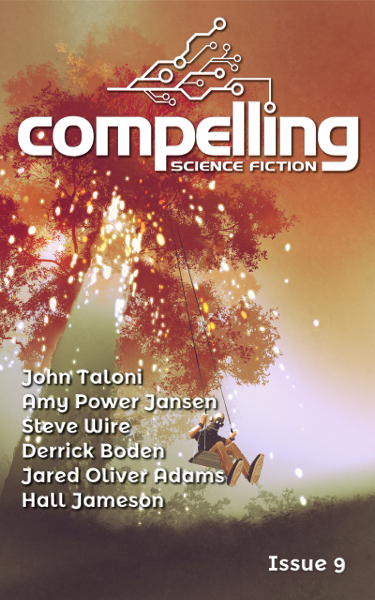 Story number six, "Driving Force" by Tom Jolly, is the shortest of the lot. In the future, AIs may not only be tasked with driving (1300 words). Our final story is "Don't Play the Blues", by Bruce Golden. A musician wrestles with experiences from his military days (6040 words). This month we have a fantastic issue with mostly longer reads, starting with Pip Coen's story "Inside-of-Body Experience". The story is a unique take on sharing a body with an intelligent alien parasite (7176 words). Our second story is the shortest of the bunch, "The Virgin of Santos de la Tierra" by E E King. The tale is about human behavior and the spread of a fungal pathogen (1725 words). 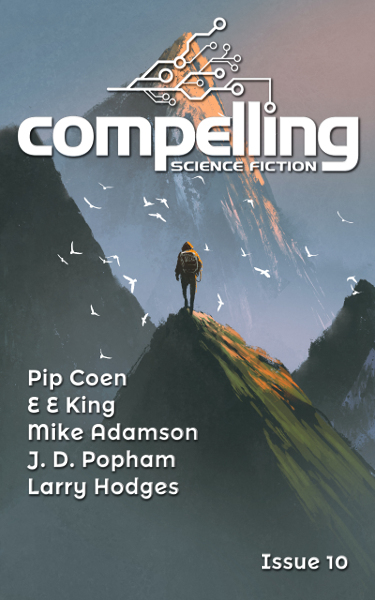 The third story this issue, Mike Adamson's "Hostile Intent," is a near-future corporate drama centering around an asteroid mining company (8009 words). Next we have "Museum Piece" by J. D. Popham. This one is a fun action adventure about a robot that breaks out of his museum exhibit on Mars (6000 words). Our final story is "Redo" by Larry Hodges. The story follows an alien census taker who spends 83,000 years taking a worldwide human census – and he’s only halfway through (6300 words). This month we have a long six-story issue jam-packed with interesting concepts! John Taloni's story "Fermi's Last Survivor" is a possible explanation for the Fermi Paradox (3850 words). Our second story, "The Fare to Ride the Universe" by Amy Power Jansen, has the most fantasy-flavor of anything we've ever published. It's a tale of introspection (7450 words). The third story in our line-up, Steve Wire's "Catallactics on an Asteroid," is about mining asteroids and artificial intelligence (5333 words). Next we have "Wait Calculation" by Derrick Boden. This one is about members of a generation ship that question their mission (4800 words). Our fifth story is "Urban Fanfare" by Jared Oliver Adams. This near-future story follows a young man who helps his politician mother with an event, in ways he never intended (7200 words). Our final story is "Sounds of the New World" by Hall Jameson, a story about overcoming disabilities in a post-apocalyptic scenario (3500 words). I'm happy to present another five compelling stories by some fantastic authors! Our first story this time around—"Emerging from the Shadows" by Clinton Lawrence—is a fun adventure that follows two young women who grew up on an asteroid colony founded by a hijacked colony ship 60 years prior. The women find their world disrupted when the colony has its first encounter with a ship from earth. (8800 words). The second story in our line-up, Matt Fuchs' "National Mission System," is a fascinating look at an AI that was created for the express purpose of overhauling the constitution of the United States (4840 words). 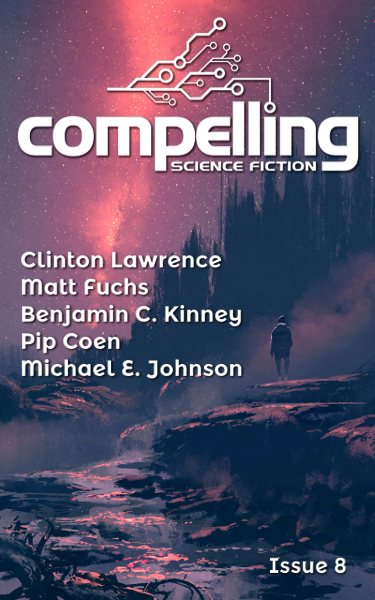 Our third story, "The Setting of the Sun" by Benjamin C. Kinney, is a short, beautiful tale about a complex machine swarm designed to harvest energy from stars (1300 words). Next we have "Paint by Numbers," another poignant piece by Pip Coen. This one is about a young woman who works for a military program after she demonstrates tremendous genius at "composing" space fleet battle simulations (2010 words). Our final story is "The Dirt Dances" by Michael E. Johnson. The story is about a new kind of hard labor that an old man teaches his young protégé (2300 words). I'm proud to present a record six compelling stories for your entertainment! I've never seen quite this level of enthusiasm surrounding a group of stories from our volunteer advisers. I'm also happy to say that fully half of these stories are debuts by new authors — thanks for supporting them! 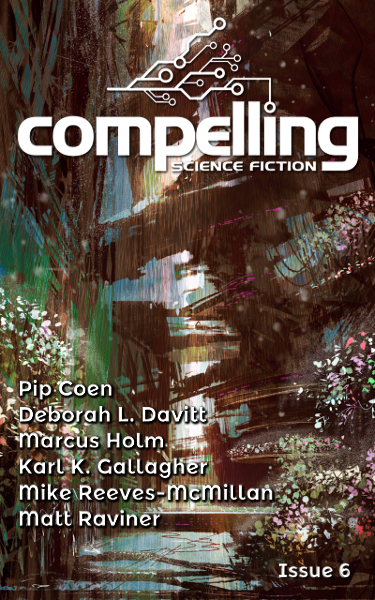 The issue begins with "Floaters Can't Float", an impressive debut story by Pip Coen. An unexpected artifact of time travel causes a zone of New York to become unlivable, and an old archiver guides a reporter through the zone. This is one of those stories that is difficult to capture with a brief synopsis, but it is both poignant and novel (6400 words). The second story in our line-up, Deborah L. Davitt's "Demeter's Regard," is a moving story about a generation ship and the deep relationship that springs up between the ship AI and a man born several generations into the voyage. (5000 words). Our third story (another debut), "Quantum Coursework" by Marcus Holm, is a very fun, technical story about a recursive universe simulation. It's a story that is hard to hold in your head but entertaining to discuss (2889 words)! Next we have "Samaritan" by Karl K. Gallagher, a coming of age story about a boy raised on an Amish-like moon colony. It's a feel-good journey of personal discovery (5600 words). 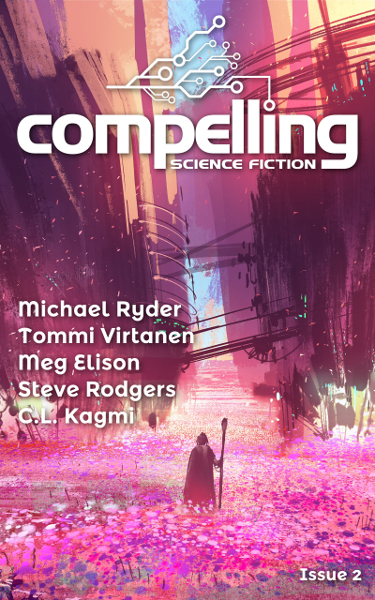 Our fifth story is a near-future tale, "Aspiration Value" by Mike Reeves-McMillan. The story follows a social media model as she navigates a world where her livelihood depends on maintaining a polished veneer in nearly every aspect of her life (2900 words). In our final story, Matt Raviner has crafted a quick, interesting time travel debut in the form of "The Meta Traveler." It's a short work about a brilliant and power-hungry would-be despot who uses time travel as a weapon (1959 words). I'm happy to present another five compelling stories for your entertainment! This issue is on the longer side, coming in at a total of 32500 words. 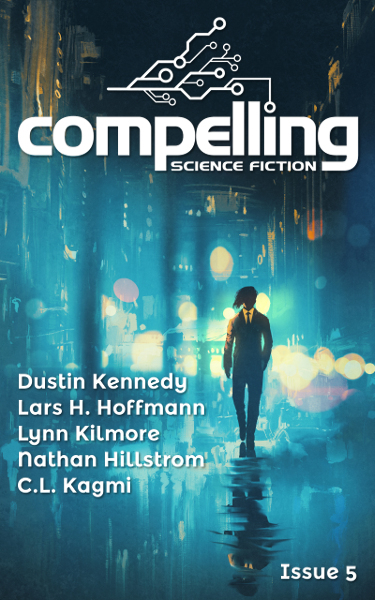 The issue begins with "Tav" by Dustin Kennedy, a complex near-future story about an augmented reality company, and about how a man reacts to a secret entrusted to him by his long-time friend and business partner. This knowledge becomes a test of his very sense of self (9250 words). 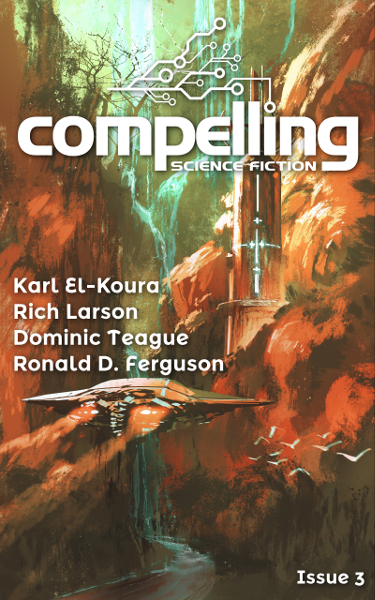 The second story in our line-up, "Entangled," (by Lars H. Hoffmann) is set in space, where a single man is on an incredible mission of discovery (5800 words). Our third story, "X and Y" by Lynn Kilmore, explores how society copes when a madman creates a virus that targets women (5930 words). Next we have "White Dust" by Nathan Hillstrom, a story exploring the concept of self when humans can be easily copied and sent over large distances (5800 words). In our final story, C.L. Kagmi is back with "Skychildren," an exciting tale about a secret commune in the asteroid belt full of illegally genetically engineered humans. I'm very proud to present another five compelling stories for your entertainment. 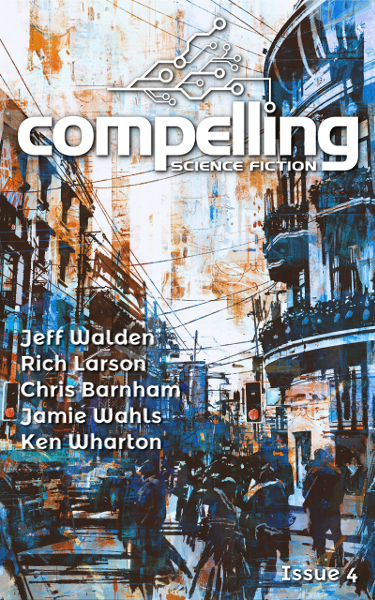 The issue begins with "They Breed Like Flies" by Jeff Walden, a fun, detailed look at the social behaviors of an alien society. The story focuses on a creature at the edge of adulthood as he navigates his own cultural institutions and encounters a human first contact party (8000 words). The second story in our line-up is darker than we normally publish; Rich Larson's "We Are Destroyers" is a story about an AI-controlled commune that is attacked by religious fanatics (2700 words). Our third story is also an AI story: "All That Is Solid" by Chris Barnham. The story is about an emergent empathetic AI that is dismantled out of concern over potential repercussions (4330 words). Next we have "The Little Gods" by Jamie Wahls, a story about what it's like for parents to watch their enhanced child become vastly more intelligent and capable than them. It's a nice short story with a nice ending (1700 words). Our last story, "Down and Out" by Ken Wharton, is a fascinating piece of world-building. The narrative revolves around members of an alien water-dwelling species as they make incredible discoveries about their world (6600 words). 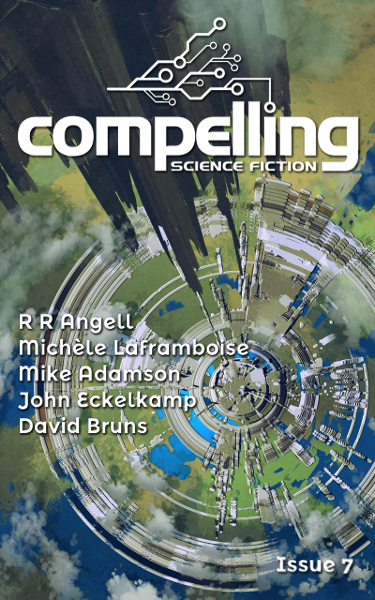 "Down and Out" is excerpted with permission from Science Fiction by Scientists: An Anthology of Short Stories published by Springer Science + Business Media. I'm ecstatic to present another four amazing stories for your entertainment. The issue begins with "the Undertow Jackpot" by Karl El-Koura. You really don't want spoilers for this one, so I'll just say that it's a story about parenthood and human nature. The second story in our line-up is a short one, Rich Larson's "TrashureIsland." It's about a positive application of augmented reality. Our third story is one of the best time travel stories I've ever read: "the Law of Diminishing Returns" by Dominic Teague. The story is full of dark humor and smart plot devices. Rounding out issue 3 is the longest story we've published to date, "Intent to Occupy" by Ronald D. Ferguson. "Intent to Occupy" has the feel of golden age science fiction, bringing a wonderful human element to the asteroid belt. 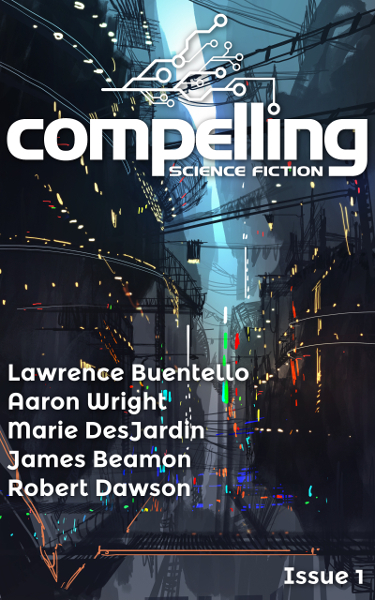 I'm excited to present an incredible line-up of stories in our second issue of Compelling Science Fiction! Our first story, Michael Ryder's "Crinkles," takes place on a space station and witnesses the birth of an emotional AI. We continue this off-world trend with "Seeds of War" by Tommi Virtanen. "Seeds of War" is a short first-contact story from the perspective of the contacted, and that's all I'll say to avoid spoilers. Our third story, "Personal Trainer" by Meg Elison, provides our second unique take on mind transference (see this story from issue 1 for a different kind of mind transference). Next comes the longest story we've ever published, "Oelinium," by Steve Rodgers. "Oelinium" clocks in at around 8000 words, and does the difficult job of introducing a sprawling universe in short-story form. Rounding out this issue is "Twiceborn," by C.L. Kagmi. "Twiceborn" is told from the perspective of an ancient race trying to survive xenocide. I hope you enjoy reading these stories as much as I did! This first issue contains five excellent (dare I say, compelling) stories. We start with Lawrence Buentello's "Gaia's Children," an intense tale about planetary colonization. Our second story, Aaron Wright's "Reflection," gives a glimpse into the life of a sentient hospital. We follow that up with "Mean and Clean" by Marie DesJardin, a lighthearted look at a unique alien life-form. "Opportunities for Lost Children" by James Beamon comes next, giving an interesting take on mind transference. Rounding out our lineup is "the Art of Failure" by Robert Dawson, an exhilarating first contact situation with a clever resolution.